The Fill Down command in the Edit menu fills all cells in the selected range of cells within a single column with the contents of the first cell in the range. This command is only available for editable cells. Select a range of cells by clicking in the first cell and dragging down the column to highlight the desired area. 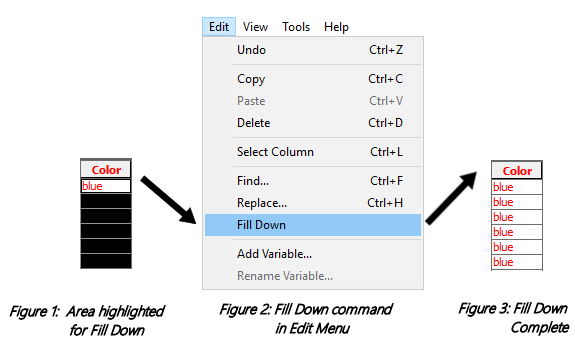 With the desired area highlighted, select the Fill Down command from the Edit menu. The value from the first selected cell will be filled into the other cells in the selected area.